AS A young man visiting his father's Kampong Bugis factory in the late 1970s, Mr Lee Kin Hong would watch the comings and goings of boats on the water. "There were timber logs flowing down the Kallang River," the soft-spoken man recounts. "They built sampans and tongkangs (a type of wooden boat) nearby. There was a bustling trade in boats... it was quite messy." The boatmakers' huts have since vanished and the timber merchants no longer ply that route. And Mr Lee, 60, has taken over as managing director of his father's firm, Singapore-Johore Express (SJE). Set up in 1947, SJE operates buses to Malaysia. The family's Singapore-Johore Factory still stands, but not for long. The Lees plan to redevelop it into a new 30-storey condominium called Kallang Riverside. The eight-storey building was built around 1978 to house bus maintenance services, but is now used mainly by short-term tenants as a warehouse. 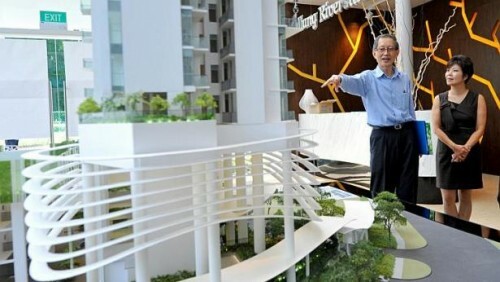 Mr Lee told The Straits Times earlier this week at the condo's newly-built showflat that he plans to begin tearing down the factory by the end of this year. In its place will be a 212-unit condo that will have an "open concept... when you move in it will feel like a park. We want it to merge into the garden". There will be seven shops on the ground level, he said, adding that there are plans for an infinity pool on the 24th floor, offering a view of Marina Bay Sands and the new Sports Hub. Mr Lee plans to sell units at about $1,900 to $2,350 per sq ft (psf), though he added that without the property market cooling measures, he would have priced it at around $3,000 psf. Although the building plan for Kallang Riverside was formally approved only in March, plans to redevelop the site have been on the drawing board for nearly two decades. The Singapore-Johore Factory was built in Kampong Bugis because that was near the bus terminal at Ban San Street in Bugis, where the Singapore-Johore Express buses would stop, he said. When SJE moved its bus maintenance depot to Sin Ming in the 1980s, the factory was rented out to an array of tenants. "We had printers, shoemakers... glassmakers, (those making) textiles. Even boilermakers. Most were related to retail activities in the city." In the early 1990s, SJE wanted to refurbish the factory and build an extension. But when they sought approval from the authorities, "the matter was delayed for some time", he said. "They told us they were going to relook the concept plan for Kampong Bugis." Mr Lee then found out from government land planners in 1994 that his family's freehold plot at 51 Kampong Bugis was to be rezoned from industrial to residential land. SJE thus had to submit a new plan to build a residential development on the land parcel. It refined it "countless times" over two decades in discussion with various government agencies. Its plan was finally approved in principle last year, before the Urban Redevelopment Authority's draft masterplan was released. The masterplan earmarked Kampong Bugis, bounded by Kallang Road and Crawford Street, as a residential and lifestyle district. Kallang Riverside will technically be SJE's maiden residential project, but Mr Lee said the firm's sister company, Melodies, is developing the 41-unit Riverside Melodies at St Michael's Road. Melodies also developed the 72-unit Cassia View at Guillemard Road, completed in 1998. Both projects are freehold. Kallang Riverside opens for preview tomorrow. It is expected to launch later this month, but the date is yet to be fixed.